A brake is a device for slowing or stopping a moving machine part. 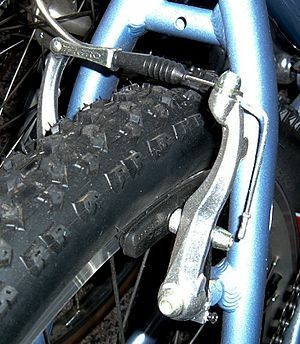 The most common brakes are for wheels, such as those on cars and bicycles. Single pivot side-pull bicycle caliper brake. Frictional brakes are most common and can be divided broadly into "shoe" or "pad" brakes, using an explicit wear surface, and hydrodynamic brakes, such as parachutes, which use friction in a working fluid and do not explicitly wear. Typically the term "friction brake" is used to mean pad/shoe brakes and excludes hydrodynamic brakes, even though hydrodynamic brakes use friction. Friction (pad/shoe) brakes are often rotating devices with a stationary pad and a rotating wear surface. 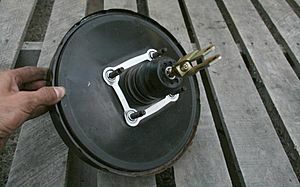 Common configurations include shoes that contract to rub on the outside of a rotating drum, such as a band brake; a rotating drum with shoes that expand to rub the inside of a drum, commonly called a "drum brake", although other drum configurations are possible; and pads that pinch a rotating disc, commonly called a "disc brake". Other brake configurations are used, but less often. For example, PCC trolley brakes include a flat shoe which is clamped to the rail with an electromagnet; the Murphy brake pinches a rotating drum, and the Ausco Lambert disc brake uses a hollow disc (two parallel discs with a structural bridge) with shoes that sit between the disc surfaces and expand laterally. 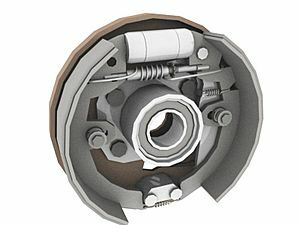 A drum brake is a vehicle brake in which the friction is caused by a set of brake shoes that press against the inner surface of a rotating drum. The drum is connected to the rotating roadwheel hub. Drum brakes generally can be found on older car and truck models. However, because of their low production cost, drum brake setups are also installed on the rear of some low-cost newer vehicles. Compared to modern disc brakes, drum brakes wear out faster due to their tendency to overheat. The disc brake is a device for slowing or stopping the rotation of a road wheel. A brake disc (or rotor in U.S. English), usually made of cast iron or ceramic, is connected to the wheel or the axle. To stop the wheel, friction material in the form of brake pads (mounted in a device called a brake caliper) is forced mechanically, hydraulically, pneumatically or electromagnetically against both sides of the disc. Friction causes the disc and attached wheel to slow or stop. Pumping brakes are often used where a pump is already part of the machinery. For example, an internal-combustion piston motor can have the fuel supply stopped, and then internal pumping losses of the engine create some braking. Some engines use a valve override called a Jake brake to greatly increase pumping losses. Pumping brakes can dump energy as heat, or can be regenerative brakes that recharge a pressure reservoir called a hydraulic accumulator. Electromagnetic brakes are likewise often used where an electric motor is already part of the machinery. For example, many hybrid gasoline/electric vehicles use the electric motor as a generator to charge electric batteries and also as a regenerative brake. Some diesel/electric railroad locomotives use the electric motors to generate electricity which is then sent to a resistor bank and dumped as heat. Some vehicles, such as some transit buses, do not already have an electric motor but use a secondary "retarder" brake that is effectively a generator with an internal short-circuit. Related types of such a brake are eddy current brakes, and electro-mechanical brakes (which actually are magnetically driven friction brakes, but nowadays are often just called "electromagnetic brakes" as well). Electromagnetic brakes slow an object through electromagnetic induction, which creates resistance and in turn either heat or electricity. Friction brakes apply pressure on two separate objects to slow the vehicle in a controlled manner. Peak force – The peak force is the maximum decelerating effect that can be obtained. The peak force is often greater than the traction limit of the tires, in which case the brake can cause a wheel skid. Continuous power dissipation – Brakes typically get hot in use, and fail when the temperature gets too high. The greatest amount of power (energy per unit time) that can be dissipated through the brake without failure is the continuous power dissipation. Continuous power dissipation often depends on e.g., the temperature and speed of ambient cooling air. Fade – As a brake heats, it may become less effective, called brake fade. Some designs are inherently prone to fade, while other designs are relatively immune. Further, use considerations, such as cooling, often have a big effect on fade. Smoothness – A brake that is grabby, pulses, has chatter, or otherwise exerts varying brake force may lead to skids. For example, railroad wheels have little traction, and friction brakes without an anti-skid mechanism often lead to skids, which increases maintenance costs and leads to a "thump thump" feeling for riders inside. Power – Brakes are often described as "powerful" when a small human application force leads to a braking force that is higher than typical for other brakes in the same class. This notion of "powerful" does not relate to continuous power dissipation, and may be confusing in that a brake may be "powerful" and brake strongly with a gentle brake application, yet have lower (worse) peak force than a less "powerful" brake. Pedal feel – Brake pedal feel encompasses subjective perception of brake power output as a function of pedal travel. Pedal travel is influenced by the fluid displacement of the brake and other factors. Drag – Brakes have varied amount of drag in the off-brake condition depending on design of the system to accommodate total system compliance and deformation that exists under braking with ability to retract friction material from the rubbing surface in the off-brake condition. Durability – Friction brakes have wear surfaces that must be renewed periodically. Wear surfaces include the brake shoes or pads, and also the brake disc or drum. There may be tradeoffs, for example a wear surface that generates high peak force may also wear quickly. 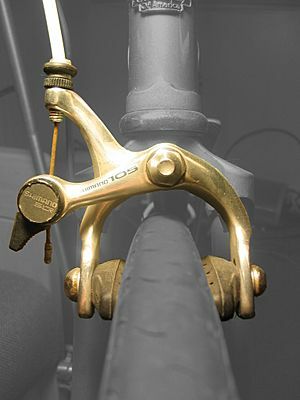 Weight – Brakes are often "added weight" in that they serve no other function. Further, brakes are often mounted on wheels, and unsprung weight can significantly hurt traction in some circumstances. 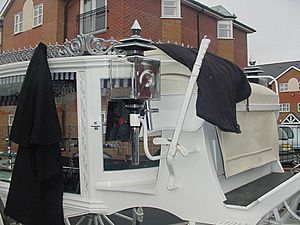 "Weight" may mean the brake itself, or may include additional support structure. Noise – Brakes usually create some minor noise when applied, but often create squeal or grinding noises that are quite loud. Foundation components are the brake-assembly components at the wheels of a vehicle, named for forming the basis of the rest of the brake system. These mechanical parts contained around the wheels are controlled by the air brake system. The three types of foundation brake systems are “S” cam brakes, disc brakes and wedge brakes. Most modern vehicles use a vacuum assisted brake system that greatly increases the force applied to the vehicle's brakes by its operator. This additional force is supplied by the manifold vacuum generated by air flow being obstructed by the throttle on a running engine. This force is greatly reduced when the engine is running at fully open throttle, as the difference between ambient air pressure and manifold (absolute) air pressure is reduced, and therefore available vacuum is diminished. However, brakes are rarely applied at full throttle; the driver takes the right foot off the gas pedal and moves it to the brake pedal - unless left-foot braking is used. Because of low vacuum at high RPM, reports of unintended acceleration are often accompanied by complaints of failed or weakened brakes, as the high-revving engine, having an open throttle, is unable to provide enough vacuum to power the brake booster. This problem is exacerbated in vehicles equipped with automatic transmissions as the vehicle will automatically downshift upon application of the brakes, thereby increasing the torque delivered to the driven-wheels in contact with the road surface. Although ideally a brake would convert all the kinetic energy into heat, in practice a significant amount may be converted into acoustic energy instead, contributing to noise pollution. For road vehicles, the noise produced varies significantly with tire construction, road surface, and the magnitude of the deceleration. Noise can be caused by different things. These are signs that there may be issues with brakes wearing out over time. Railway brake malfunctions can produce sparks and cause forest fires. A significant amount of energy is always lost while braking, even with regenerative braking which is not perfectly efficient. Therefore, a good metric of efficient energy use while driving is to note how much one is braking. If the majority of deceleration is from unavoidable friction instead of braking, one is squeezing out most of the service from the vehicle. Minimizing brake use is one of the fuel economy-maximizing behaviors. While energy is always lost during a brake event, a secondary factor that influences efficiency is "off-brake drag", or drag that occurs when the brake is not intentionally actuated. After a braking event, hydraulic pressure drops in the system, allowing the brake caliper pistons to retract. However, this retraction must accommodate all compliance in the system (under pressure) as well as thermal distortion of components like the brake disc or the brake system will drag until the contact with the disc, for example, knocks the pads and pistons back from the rubbing surface. During this time, there can be significant brake drag. This brake drag can lead to significant parasitic power loss, thus impacting fuel economy and overall vehicle performance. Brake Facts for Kids. Kiddle Encyclopedia.